Are you SO excited? It’s time for Jingle Bells, Elf on the Shelf, freshly baked Christmas cookies and most fa-la-la of all, our annual Peace, Love and Pajamas Studio Mini Sessions! This is the jolliest of all of the studio mini sessions. Bring your sweet kiddo(s) in wearing their 2018 Christmas themed pajamas and enjoy the Christmas cheer! Sessions will be held at my photography studio in Santee. Sessions will be back-to-back and will last fifteen minutes each. These mini sessions are for pajama wearers only! 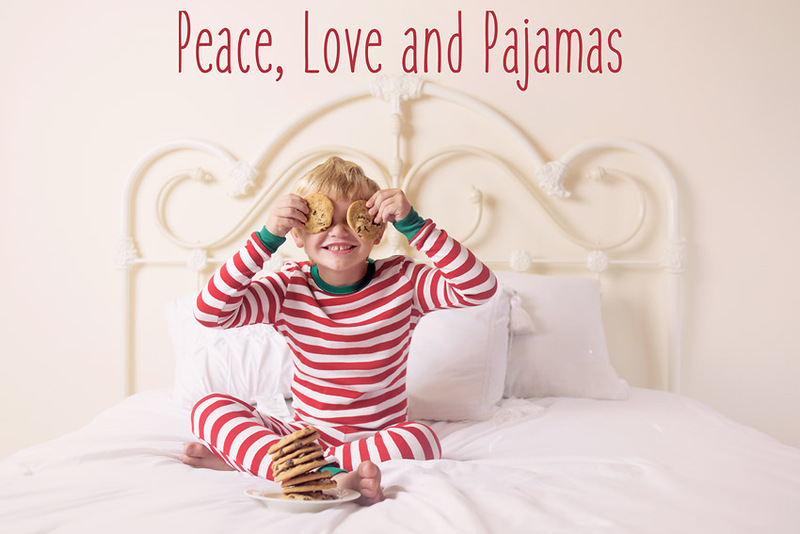 Kids, babies and parents can join in as long as you are clad in your favorite Christmas jammies. Your photo session will consist of a variety of individual, sibling, family, candid and posed shots. What’s the background like this year? This year’s sessions will take place on a full sized bed with a simple, white colored background and white comforter. I like to keep backgrounds as clutter-free as possible, focusing on your kiddo and their adorable pajamas! I will have a couple of props on hand if you wish to use them, including a plate full of chocolate chip cookies, red mugs with pretend hot chocolate, and The Night Before Christmas book. If you wish to bring along your kiddo’s favorite stuffed animal, Christmas book, Elf on the Shelf or other prop to incorporate, feel free to do so! To book your time slot, please scroll down to the calendar below. Select your date and preferred time, and you will automatically be transferred to PayPal in order to complete your booking. These packages are prepaid and all-inclusive. They include our fifteen minute session and THREE digital images. Additional images are available for $25 per image. Sessions are prepaid and are non-refundable. In the event of a meteor hitting San Diego County, a zombie apocalypse or a fever-ish kiddo on the day of our session, you may be able to apply 50% of your package fee towards a future studio mini session.